Many years ago this recipe came to me via a message board I was on. A lot of times someone would post a recipe and about 100 people would make it within a week of hearing about it….. and then give their 2 cents. With this recipe everyone was raving that this was “the best vodka sauce recipe ever”…..I think one person even ventured to say she’d like to bathe in it, she liked it so much. Sounds..kinda….I don’t know…..fun??? Once I made it, I had to agree!! 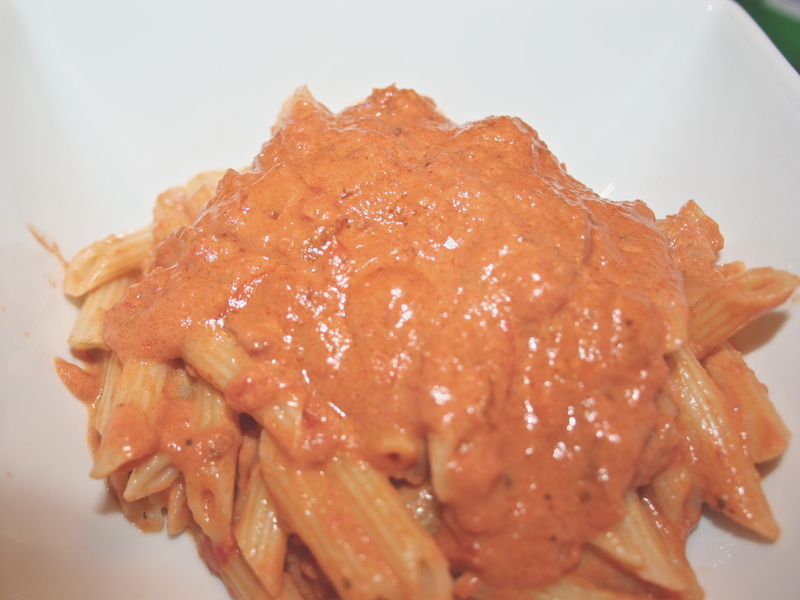 I have a few different ways I make/have made vodka sauce, but this one is by far the best! It’s the perfect thickness, with the best flavors…. all rolled into one delicious bowl of pasta! My kids and my husband both love it…so it’s a winner in our house. It’s also a great thing to make extra of and freeze for a night when you don’t feel like cooking…it defrosts and reheats nicely and is just as good as the first time! It’s also just as delicious leftover! We aren’t a huge “leftover family” (is that even a phrase? I dunno?) but I usually make just enough dinner that there isn’t anything left over for another night. Not the case for this sauce! I urge you to make extra and have a lot left over. I think my anti-leftover mentality comes from when my Mom would say (every so often), “LEFTOVERS TONIGHT!” And all of us groaning because it was normally something we didn’t like the first time around…..which was why it was left over to begin with! Makes sense…yes? I grew up with 2 brothers, so normally the good stuff was gone, FAST…..and didn’t need another night. The bad stuff….well it was packaged up for another night. Secretly it probably made my Mom happy….because she didn’t have to cook that night. I’ve gone off on a tangent and off the subject. Get used to that…it will happen again. In a small bowl soak pepper flakes and vodka (NO MORE THAN 5-8 MINUTES if you don’t want it too spicy — the longer you soak the spicier it is). Then using a small colander, remove pepper flakes….keeping the vodka. Saute bacon, oil and onion for 8 minutes in a medium pot. Add crushed tomatoes and vodka. Add cheese, heavy cream and butter. Cook pasta as directed on box and drain. Make sure to keep stirring so the cheese doesn’t stick to the bottom and burn! Previous Salsa Chicken Next Potato Soup’s On!